Everyone likes to succeed and feel like they're doing a good job at work. No matter how large or small your responsibilities, all humans need a sense of accomplishment to be satisfied with their work. Now imagine coming in to work every day and, over and over again, being barraged with requests that you don't have the tools to handle. You don't have access to the system you need to answer this question, or you can't contact the person who can help with that question. You're trying to do a good job, but everywhere you turn, you hit a wall. Customer service agents deal with this every single day. And over time, the repeated disappointment from frustrated customers really wears an agent down. Turnover in customer support centers is high, which costs your business a lot of money and leaves your customers without resolution. If you want to improve your customer experience and drive better business metrics, you need to start by improving your agents' experience. 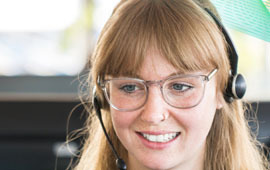 Download this whitepaper and learn about the two main problems customer support agents face, and three steps you can take to make your agents' lives easier, deliver higher customer satisfaction, and drive better business results.